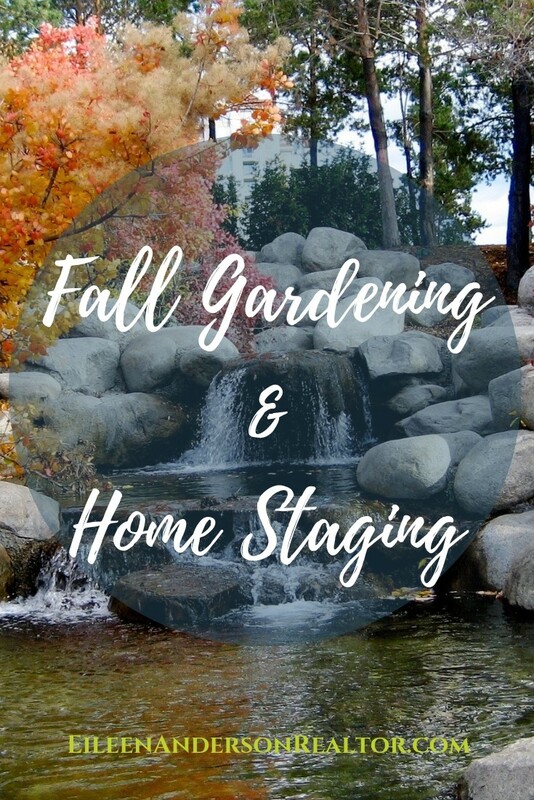 Fall Gardening Tips To Get Your Home Ready To Sell! The fall real estate market is upon us and you are getting ready to sell your home. Your lawn and gardens are looking tired. Now is the time to tidy up the yard, patio, outdoor living spaces. In this article you will have a complete checklist of all the things you can do to enhance your property for a speedy sale. Home staging, to create a warm and welcoming feel for the potential home buyers, is an important element of selling a home. However, many sellers neglect the yard during this process. Some homes are small and crowded which can turn off potential buyers. Creating outdoor “rooms” is a great way to expand your living space. If you have a small space where you can create a bluestone patio with attractive seating, this would be a great investment and add to the value of your home. Add some colorful pillows and pottery for color. If you have one living room and need a place to escape for some down time or privacy, imagine going outside to a patio or a city rooftop garden to sit and wash away the workday. Perhaps you are a new home owner and you want to increase the value of your property but don’t know where to begin. 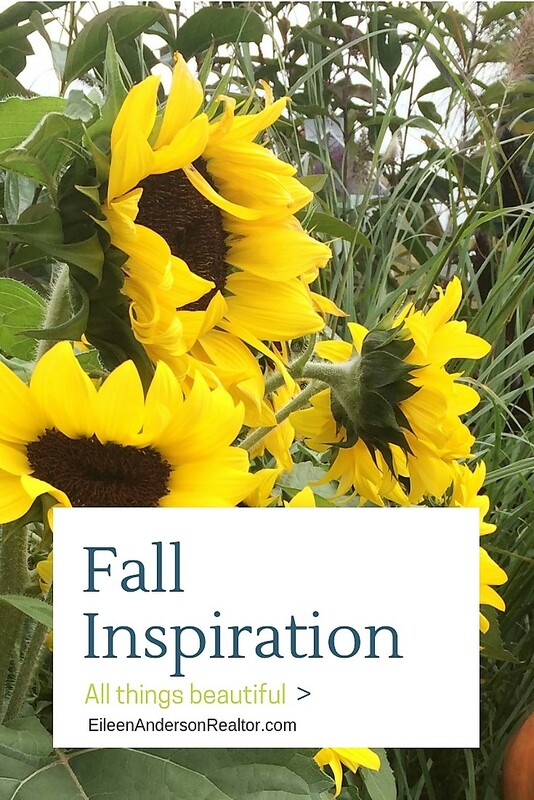 This checklist will be handy each fall as you design and grow your gardening skills. 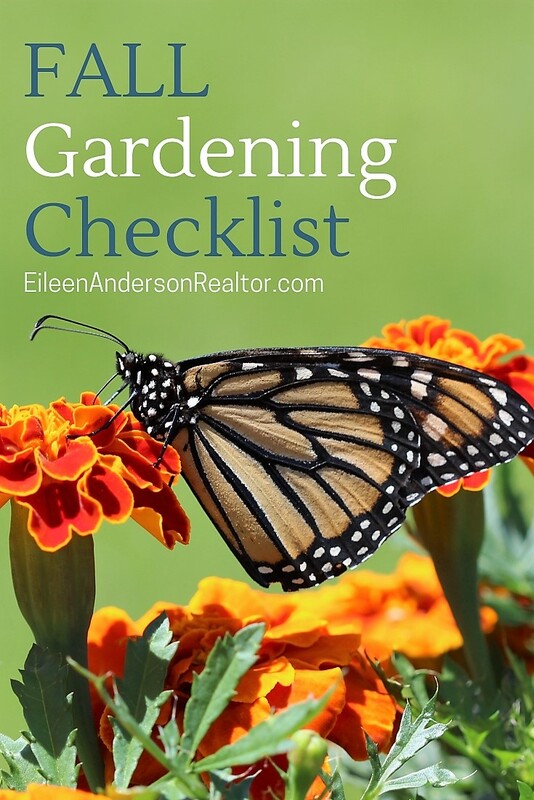 Just like the fall there is a spring gardening “to do checklist” if you are putting your home on the market in the spring. 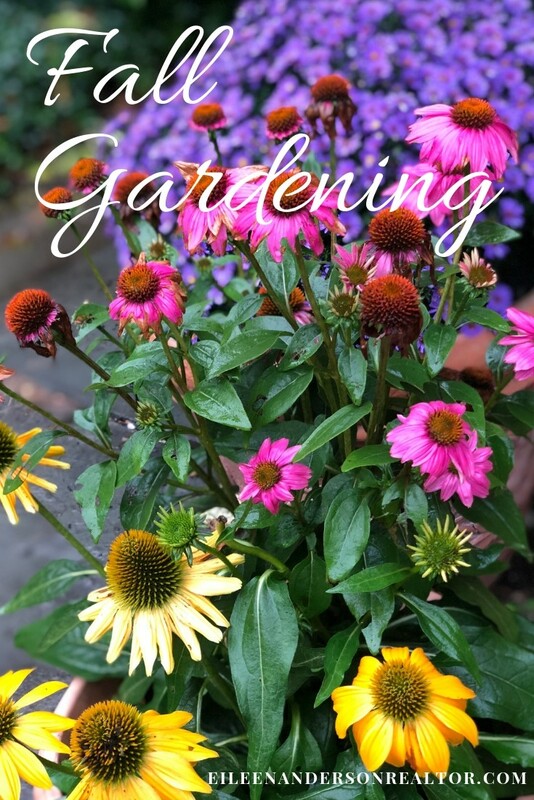 There is no beginning or end to gardening. It is a process to plan and dream about. How many times do you move your furniture or art around to get a new look inside your home? The same goes for gardens! Don’t be afraid to move and divide your plants to express your style. Now is a perfect time to prepare the soil for next years shade garden. After a long winter you will be surprised and excited to see what the new garden will look like. Worried about how much you can actually do? No time to do it? Maybe you are not in good enough physical shape? Skip the boring treadmill at the gym and get out in sun! When you work in the yard, you use every muscle in your body and when you are done you will have created a beautiful space for you and your family to enjoy. You will also improve the potential value of your home. Have fun! Order some compost and create a “holding bed” with good soil to divide plants and store them for spring before starting your division of overgrown plants. Then in the spring you can move them around without shocking them. 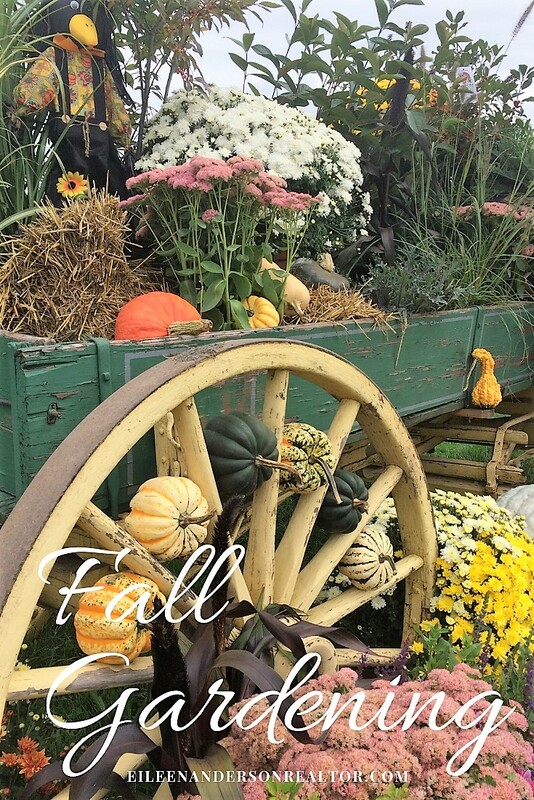 Be sure to buy some of your favorite fall plants: Mums, Asters, Montauk Daisies, Ornamental Kale & Cabbage, Fall Pansies, and Sedums. September is a good time to divide your perennials. Best to do it after a good rain. Be sure to water well after transplanting. Plant spring bulbs and cover with chicken wire to deter animals from digging. I find that animals don’t bother Daffodils. Dig, dry & store summer bulbs when they mature. 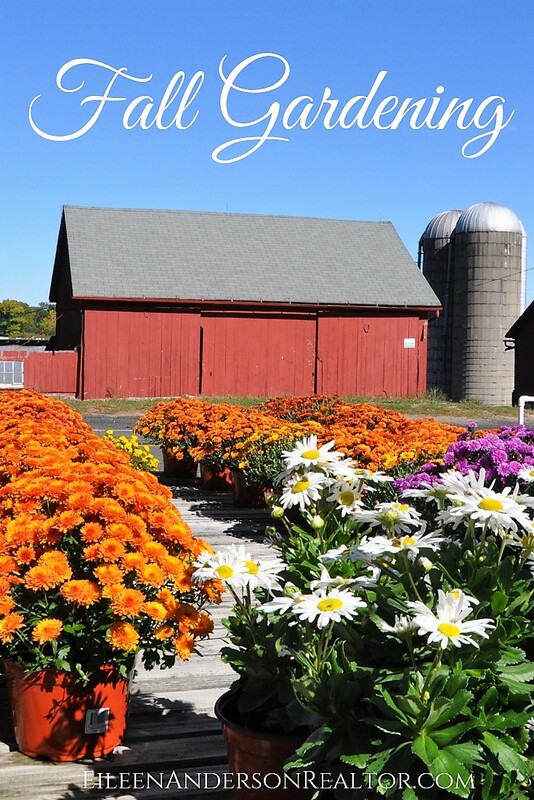 Bring in your Dahlia bulbs! I like planting Caladiums and Elephant ears for a shady tropical feel but they must also be stored indoors for the winter. Divide & replant Daylilies & Iris if they are overcrowded. Trade some plants with your friends and neighbors. Daffodils & Daylilies can be planted in the same bed. The emerging foliage of Daylilies will hide the drying foliage of the bulbs. Mulch perennials after the first hard frost. Tie climbing roses against the wind. Hybrid tea roses should be mulched with soil 8” high around them. Leave seed heads on ornamental grasses for winter interest. Iris borers lay eggs in September, clean up iris bed. Winter grasses are beautiful don’t cut them till spring. best in a dark area that is 70* to 80*F, with a slight draft. Harvest seeds of dill, coriander & caraway by hanging stems with the seed heads enclosed within a paper bag. Pull onions when the tops have dried. Leave them in the sun for 3 or 4 days to cure. Pumpkins, gourds & winter squash should ripen on the vine & be harvested with stems intact. Cut stems about 1” from fruit. Once harvested, leave them outside for 3 or 4 days to season. Dispose of old vines to prevent insects & diseases from overwintering in the garden. Wash tomato stakes with disinfectant as you finish with them for this year. Harvest sunflower seeds for feeding the birds or for next year’s flowers. Don’t forget to visit your local Farmer’s Market for some amazing produce and support our local farmers! Ornamental kale & cabbage make colorful companions for garden mums. Destroy slug egg masses found under garden debris or plastic mulch. Dig up summer-flowering bulbs such as dahlias, gladiolus & canna lilies before the ground freezes & store in a cool, dry & dark place. Remove all fruit dropped from trees to avoid disease next year; also all fallen grapes & those clinging to vines. After frost, rake dead annuals from bedding garden; add to trash can, not compost pile. Thanksgiving to achieve optimum bud production. Leave your ornamental grasses alone for winter interest and cut back in spring. Cover strawberry beds with straw after the ground freezes. Trim ends of summer-grown canes of red raspberry & blackberry back by 12” to 16”, also remove suckers which have sprouted from the ground. Remove all dead plants to not infect next years growth. Fall is an ideal time for planting trees, evergreens & shrubs. Read more about proper installation and watering here. When planting woody ornamentals water them well until the ground freezes. Harvest Pears when they reach full size. Fall browning of inner evergreen needles is normal. Continue planting trees, shrubs & perennials. The roots with continue to grow until the soil temperature drops to approximately 40*F.
Trees getting old? Plant a replacement. Warm, dry days & cool nights produce good leaf color. Do not prune spring flowering shrubs at this time. Mow around fruit trees to eliminate hiding places for rodents. Plant protection around base of fruit trees. Continue watering fall-planted trees & shrubs as needed, especially evergreens. Call a certified arborist to discuss serious tree troubles. Plant tissue freezes when temperatures drop below 30*F (water freezes at 32*F). Formation of dormant buds for next year’s spring flowers on flowering trees & shrubs is now complete. Check your spruce trees for spider mites and treat as needed. Good time to plant some trees and shrubs. If you keep houseplants outside in summer be sure to check for pests such as thrips, mealybugs, and whiteflies. Collect soil samples now to anticipate soil nutrient needs for the coming year to adjust PH. Don’t forget to drain and shut off water pipes and irrigation systems to prevent them from freezing. When the snow comes be sure to protect plants from winter damage: remove snow from evergreen and water trees during a thaw. Fall browning of inner evergreen needles is normal. Apply an anti-desiccant to shrubs now to protect broad leaf evergreens against winter die-back. Before the ground freezes hard, give the evergreens a final watering. A properly mulched plant remains warmer & the roots do not freeze as deeply. Mulched plants (especially evergreens) are able to absorb water & are less prone to desiccation during winter months. Never wrap foundation plants with plastic. Dig a hole for your live Christmas tree now so planting will be easy in frozen ground come January. Need some holiday decoration? Collect winterberry, birch twigs, dried hydrangea flowers. Dormant trees can be moved if the ground isn’t frozen. Many junipers turn bronze colored in the winter – they will return to green in the spring. Prune vines that have climbed tree trunks (poison ivy, wisteria, wild grapes, bittersweet, wild rose). Best time of year to do this when you can wear heavy clothing to protect your skin. increased moisture & no weed or crabgrass competition… all these factors will contribute to spectacular results. Apply fall fertilizer for strong root growth. Plant bulbs so their tops are at a depth equal to three times their height. Plant tip side up. Rodents eat tulip & crocus bulbs but avoid daffodils. Cut peonies down to ground level & destroy leaves. Mulch Roses when ground has frozen. Hostas are going dormant. After foliage has yellowed & browned, cut stalks to the ground. Skunks in the lawn are searching for insects. Avoid using grass clippings as mulches if they have been treated with pesticides or herbicides. Remove leaves from newly seeded lawns. Old stumps rot quickly when covered with soil. Rake up leaves & needles from lawn. Try growing some herbs on a sunny kitchen windowsill. Put pumpkins on the porch for seasonal color. Remember to carve a Jack-O-Lantern! Waxing refers to when the moon is increasing. Waning refers to when the moon is decreasing. Keep Christmas cactus in cool temperatures (50-55*F at night) to set flower buds. Put leftover pesticides in a safe place. Store all pesticides in original containers with labels intact. Move African violets to a brighter location. Clean, repair & store garden furniture now. Gather up hoses, clean & store for winter. Remove soil from outdoor ceramic flower pots to prevent breakage from freezing & thawing. Bring in Bird Baths and other garden art. Send your lawn mower for tune-up. Hoses will freeze and crack. Drain the garden hoses. Shut off & drain outside faucets. Knock down outdoor wasp nests. Want to save some herbs indoors? Try parsley. Clean your bird houses for next year. Put out bird feeders! Bears are sleeping. Pesticides will freeze, store in a secure, cool and dry place. Keep your house free of insects by storing firewood outside. Animals are looking for warm places to nest – secure your attic. Great time to clean stone walkways and patios or build a stone wall. 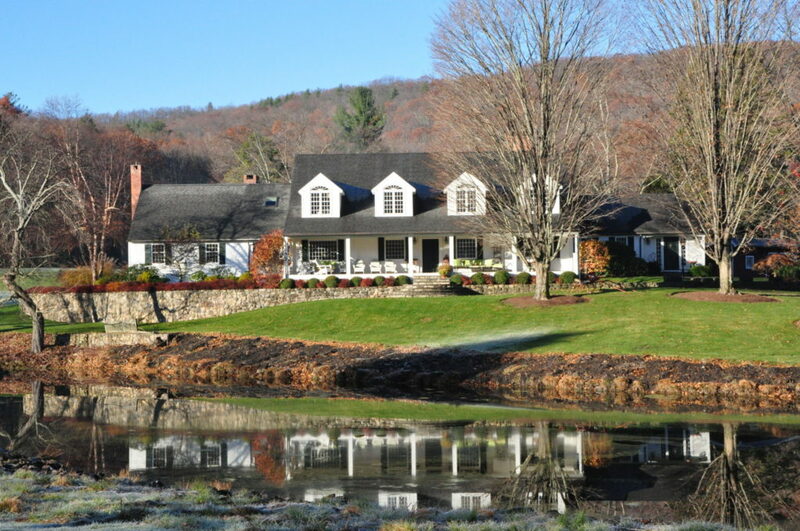 I am licensed for residential real estate sales in the state of Connecticut including but not limited to the following CT towns: Avon, Bloomfield, Burlington, Barkhamsted, Bristol, Canton, Colebrook, Granby, East Granby, Hartland, Hartford, Suffield, Windsor, New Hartford, North Granby, Farmington, Newington, Litchfield, Simsbury, Suffield and West Hartford, CT.